The grand total came to be exactly 500,000 words, which was a wonderfully pure number. That means that if I (or J.) ever seriously want to publish this book, it will split nicely into 5 parts of 100,000 words each – very ideal for the publishing world. Maybe this is a sign! The entire writing part will be completely finished (and these projected finish dates allow time for planning days) on 11/11/10, which will be J’s 21st birthday, interestingly enough. I did not plan for the writing to be over on that day, but sometimes things are more than coincidences. I plan to take the entire month of December 2010 to revise and complete the whole project, which includes the Strophe, the Antistrophe, and the Epode. From November 12 until November 30, I will not look at any part of XIII and will instead focus on my NaNoWriMo novel, which will be nearly halfway done by then, if I focus my efforts and go for the goal. I will. I seriously want to make the 11/11 deadline; then I’ll make a wish on my six years of work! 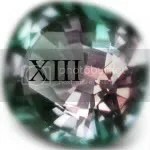 I’ll have been writing XIII in some fashion or other for six years in September! Ultimately, the final calls on the revisions and whether or not the story should be formally published will go to J. This is essentially his brainchild; I just happened to come along and help him get it out of his head and onto paper.